If there is one thing I came to understand in my career as a kitchen designer it is that drawers > doors. Think about it. It is so much easier to pull open a drawer and look down on what is inside than it is to peer into a deep dark cabinet with that stupid little top shelf that is half the depth of the cabinet. Who the heck can see what is in the back of the cabinet under that little shelf? If this is where you keep your pots and pans, you know that it is a disaster inside that cabinet. But drawers, glorious drawers! The organizational potential is limitless if you ask me. “But wait,” you say, “what about pull out drawers? Surely you are not against base cabinets with pullout drawers behind the doors?” Yes, in almost all cases I am against pullout drawers. Opening a drawer can be accomplished in one motion – you just pull it open and all of the contents are right there! How genius is that? To access the contents of a pullout drawer you have to first open the cabinet door that conceals the pullout drawer, then you can “pull out” the pullout drawer. Two steps required. Not to mention that pullout drawers are usually only seen in very shallow depths, and typically in your wider cabinets. This limits the type of items that you can store on a pullout without having to worry about items toppling over the edge. However, if your current situation does not allow a replacement of all your base cabinets with doors for drawer base cabinets – well, then adding pullout drawers may improve the accessibility to your pots and pans. Be warned that adding pullouts is not exactly a cheap solution either, though. Drawer would have been a much better choice here. This configuration requires opening the cabinet door before you can pullout the shelf inside. Also, the shelves are very shallow and items are likely to fall off the shelf. Speaking of cheap, cabinets full of drawers are ALWAYS more expensive than cabinets with doors. Making a drawer box is basically building another mini-cabinet within a cabinet, and then you have to add hardware for it to slide out on, and build a mini little drawer front for each of the drawers. Which is why you do not find many drawers in rental properties; they are expensive! However, if given the choice drawers are such a good investment when you are designing a kitchen. There are a million gimmicky little accessories you can add to your cabinets with doors. Most of these are totally unnecessary if you plan your kitchen with drawers. In my last house, I was so excited to install tray dividers in my cabinet. I thought, “Hooray, now all of my pans and trays will be organized and easy to access!” Wrong. Everything was nested into each other in a heavy mess crammed so tightly into the space. Getting out a platter required a lot of maneuvering of all the other dishes in the cabinet. If only I had planned to keep those items in drawers. Not-to-narrow, Not-too-wide: a shallow drawer allows an unfettered view of miscellaneous kitchen tools. Of course, there are some times when drawers are not practical. Like under the sink. Until recently, it was unheard of to put drawers under a sink, because the p-trap underneath the sink would be in the way of the drawers. Now cabinet manufacturers are starting to build drawers with notches in the back to accommodate the plumbing under the sink. These are becoming especially common in bathroom vanity cabinets. A sink base cabinet with the drawer notched out in the back for the p-trap. I also am a very big believer in pullout trash cans inside of cabinets, but it has to be right next to the sink. It is super convenient to have a trash can right by the sink, and not looking at an ugly garbage can is a huge plus. Typically you need a 15″ wide cabinet for a single can, and a 18″ wide cabinet for a double can configuration like the one shown here. A double trash can pullout allows for the separation of garbage and recycling. Another benefit with drawers is they are much more accommodating than base cabinets with doors when you are trying to do the no-upper-wall-cabinet-but-maybe-some-open-shelves look that is not going anywhere anytime soon. You can even put plates, bowls, glasses, etc in drawers. I will warn you that somebody may try to tell you that you need this peg drawer organizer thing that holds your dishes in place. I don’t think that is necessary. I just lined the bottom of my drawers with shelf liner to keep things from sliding around, and put in my stacks of plates and bowls, and sat my glasses on the bottom. I love it! Trust me, if you are not going to have wall cabinets, you are not going to be able to store all that stuff on shelves and have the airy kitchen look you want. You are going to have to keep a lot of stuff out of plain sight, and drawers offer the most flexibility for doing that. Having all your everyday dishes in one place is the ultimate convenience. Shallow drawers – they are great for storing spices (but if you have a crazy huge spice drawer, then get a big Tupperware and keep it in a deeper drawer), and shallower items like silverware, pans, trays, platters, and all your saran wrap and ziplocks. Trust me you need more shallow drawers than you think. 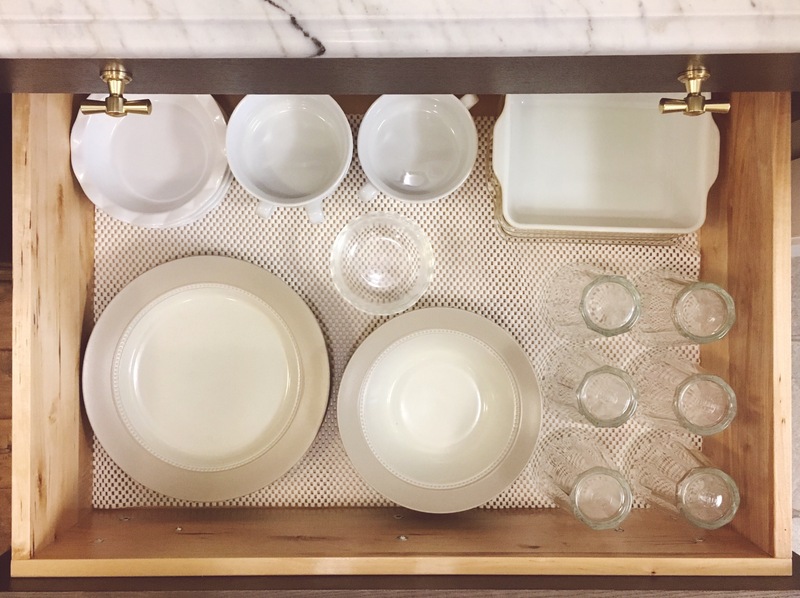 Deep drawers – no brainer, this is where you will keep your deeper items like pots, stacks of plates and bowls, glasses, folded stacks of dish cloths and dish towels, etc. Wide drawers – I like wider drawers for pots and pans, and dishes. I actually keep all of my everyday dishes in one single drawer. That way if I need a plate, bowl, glass, or all three – it’s right there in the same place. I also like using a wide shallow drawer to corral all of my aluminum foil, saran wrap, parchment paper, and ziplock bags in one place. Narrow drawers – I mean you really do not need a super wide silverware drawer. Most silverware tray organizers are going to fit into a 15 inch wide cabinet. I do believe you should keep your silverware in a drawer, and have a separate drawer for keeping other utensils – but for your cooking utensils I like to just keep those in a pretty ceramic crock on the countertop. They are too clunky and hard to organize in a drawer because they come in such odd shapes and sizes. I also like narrower drawers for storing dishtowels and dishcloths, but it really depends on how you fold your linens and how many you have. A collection of pots and pans nestled in deep drawers. Also, you don’t just have to buy new built in cabinets with drawers – think beyond kitchen cabinets! I HATE the look of kitchens that line every single bit of wall space with built in cabinets. It looks so sterile and uninspired. Nothing irritates me more than a cube shaped room lined floor to ceiling, wall to wall with cube shaped cabinets. If you have the option, incorporate some freestanding furniture to use as storage. I have two furniture pieces in my kitchen, and I love them. One is a locker that has a cage wire in the upper door that allows you to see what is on display in the top half, and a perforated pattern on the lower door that conceals what is inside below. 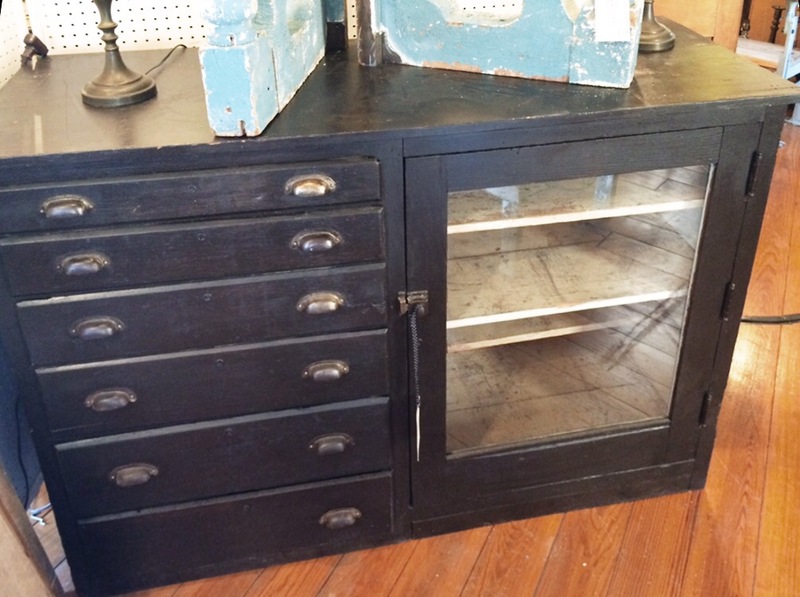 The other piece is a beautiful cabinet that I found at the Round Top Antique Fair in Texas. I freaking love that cabinet. It is about 6 feet wide and 42” high. On the left are 6 drawers that get progressively deeper as you get closer to the bottom, and on the right is a glass front door where I display my copper pots and pans and Le Cruset Dutch ovens. 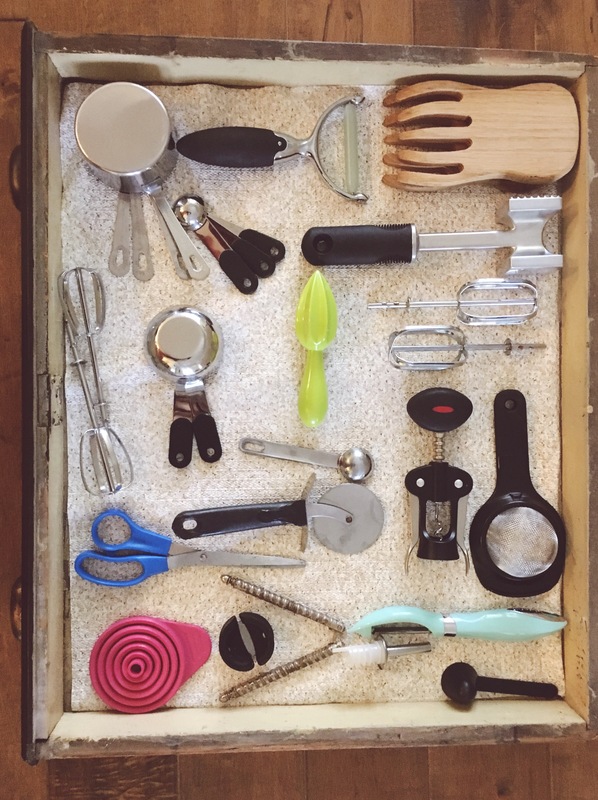 The drawers are amazing – I keep all of my little weird kitchen tools in the top drawer, like measuring cups and spoons, wine keys, those little mixer whisk things you put in the electric mixer. The rest of the drawers are organized by category, one for sheet trays, one for round pans and trays, one for my serving platters, one for rectangular pans and baking dishes, and the bottom drawer is where I keep my scale and electric juicer. My kitchen would not be nearly as functional as it is without that cabinet. I really feel like these pieces give my kitchen character, and differentiate my space from the standard builder grade kitchens you find in new construction homes. So think outside the box, and always be on the lookout for vintage or antique pieces that offer practical storage solutions that work for you. My kitchen cabinet sitting pretty at the Roundtop fair before I bought her!